or through your own book store when you give them the ISBN number. Costs about 25 euro. Standardized bioassays are frequently used to access the toxicity of chemical compounds. The standard NOEC/EC50-analysis of these bioassays suffers from several problems. This book describes a novel analysis that solves these problems. The application of this new analysis is easy with the software package DEBtox, which accompanies this book. After a general introduction by the Dutch Ministry of the Environment, the scientific background of the analysis is discussed, followed by explanations of the mathematical models and statistical aspects. The final chapter describes the use of DEBtox in non-technical terms. DEBtox runs under MS-Windows on a PC (486 or higher) and on SunOS 4.1.3/Solaris 2.5. This book will be of interest to all those involved in the assessment of the toxicity of chemical compounds. The biological backgrounds are discussed in the DEB-book. 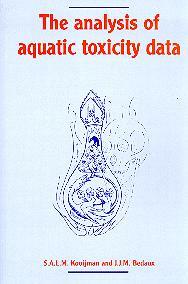 Errata in html to The Analysis of Aquatic Toxicity Data, or in LaTeX format.